“Dream Baby products are created with safety in mind.” That’s good to hear because for me, the safety of my children and those I care for is paramount. 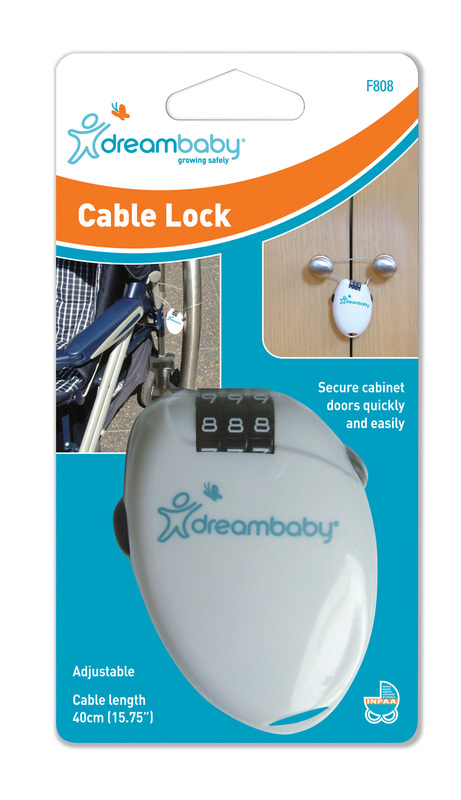 What’s great about the Dream Baby Cable Lock is that it can be used to lock cupboards, bi-fold doors, the china hutch, and refrigerators/freezers in addition to nifty uses like keeping your stroller safe when you need to park it and walk away. (I’m sure there are hundreds of uses and this lock will go way beyond typical cupboard locking years.) I can’t help but wonder how much energy my household will save with this installed on my side by side refrigerator. My youngest can no longer play in the fridge or open the door 25 times a day. What’s great about the Dream Baby Stay Put Cutlery and Bowl set is just that… it stays put. Just wet the suction cups and stick it to the table top or highchair tray. Had this bowl arrived earlier, it would have saved me countless food dumps on my floor! The dish set is BPA free, so you don’t need to worry about potentially dangerous chemicals leaching into your child’s food. My kids also think the spring/coil cutlery is fun! The Dream Baby Stay Put Cutlery + Bowl set retails for $12.95 and is available at Target, Toys R Us and Sears while the Dream Baby Cable Lock retails for $19.95 and is available online. One lucky reader will receive a Stay-Put Cutlery + Bowl set AND a Cable Lock. Leave a comment including preference for a PINK or BLUE dish set. The winner will be selected by random number generation on Wednesday, January 14th at 7PM PST and will be notified via email. Open to those with addresses in the 48 continental states, Alaska, Hawaii and members of our military with an APO/FPO. Oh my gosh! I would love this! Right now I just scoop the food onto the high chair tray because I can’t take the mess and the dropsies game! Those dishes and cutlery are awesome! I would love the blue set. I also like the looks of that lock. I can think of so many uses for it. And while sometimes it is necessary to lock dangerous things away from young hands, for the most part the best babyproofing is just smart organizing, good modelling and normal supervision/connection with your baby. I mean, locking your stroller and *walking away*? Today’s parents are disconnected from their babies enough as it is, seeming often to treat them more as luggage than as humans constantly in the process of self-building from the inside out… why would we want to further encourage this sort of thing? And of course, as soon as a toddler sees something is locked away, what does that become? Temptation! The door that must be opened! It’s just all the more interesting to them. Children generally learn self-discipline and self-restraint when actually given the opportunity to practice it, not when it’s ‘forced’ upon them through artificial means. As parents, we need to let go of our adult obsessions with “not making messes” and “get things done efficiently and expediently”, the need to make our children as little of an inconvenience on our time (and property) as possible. We have to recognize their drive and their need to explore, to investigate, to discover their entire world in their own way and their own time, since that is how we are ‘programmed’ to learn and grow. We have to make them part of our world, and accommodate *our* world to *their* needs, rather than constantly trying to re-design *their* world to fit *our* needs. I may not be popular for this opinion, but at least I’m in good company! This all comes from Dr. Maria Montessori, the great pioneer from 100 years ago who recognized how alienated children were in the adult society of her time. Many things have changed since then… other things… not so much! Wow, cool idea. Our daughter is just starting to feed herself and I can see this coming in useful. Pink for us. Heather, locking the stroller and walking away isn’t intended for when a child is in it. I can think of many full day outings where I would park a stroller (because the baby was in the sling anyway). Some people appreciate the security of a lock and not having to worry so much about the stroller walking away or Grandma’s Heirloom China getting broken. Some things we can’t risk the one or two times it takes to get a lesson through. If you do in home daycare (at least in my state) cabinet locks ARE REQUIRED for your home inspection. There are numerous uses for child safety locks. I’m a firm believer in teaching our children discipline but they also need to be safe, there are 30 other cabinets in my kitchen to learn with while still locking up my crystal and china (I don’t have traditional cleaners so that’s not an issue). There are also plenty of times for a child to learn cause and effect (drop and retrieve), like my kids did while riding in the cart through the grocery store playing with keys or a toy. They drop them, I pick them up. This is far less messy than having food all over the house. Using items like these are definitely a personal choice, but there is absolutely nothing wrong with parents desiring items that make their home a bit safer or help make life a bit easier. We have enough on our plates as it is. The great thing about this cable lock it that it is adjustable. We have a variety of different cupboards, drawers, and bifolds in our kitchen that the regular locks will not work on. Too bad this wasn’t available sooner (before the kids wrecked the center bifold cabinet). The bowl set and spoon would have done wonders in my kitchen as well- oy vay the amount of times I’ve picked up spoons from the floor-2 siberian huskies and life as a mom, need I say more. 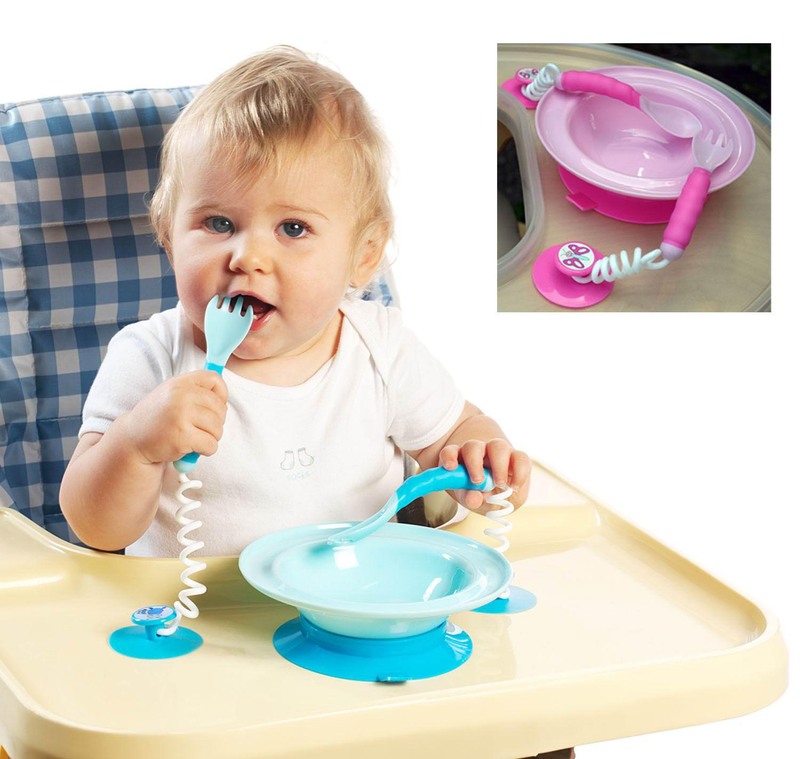 Wow, this sounds so great, I am always trying to make sure my daughter does not tip her bowl over and since she is just now starting to learn how to use her fork and loves to hold it, this would be so perfect for us. Oh, I have been DREAMING of something like this!!! My daughter really wants to feed herself but she gets really excited about dumping food on the floor…my dogs eat more organic food than I do, just from cleaning up after her! A set of dishes that will allow her to practice without making it *too* tempting to just toss everything would be GREAT! !